Pork is my favourite meat, it’s so versatile and I love it in all its forms; bacon, sausages, hams, chorizos, pâtes the list goes on … The belly pork in particular is a cut that I never tire of eating, it’s the fat that does it for me as that’s where all the flavour is. I like to slow cook it in stews to the point where the fat just melts in your mouth. It gives a great flavour boost to the sauce too, making it even more delicious. I made this when the weather was murky, wet and cold, and in need of some warming comforting stodge. The sun is busting-out-its-move as I type this now and who knows what it’s going to be doing by the time you read this, either way it’s a cracking dish and well worth a try whatever the weather. Rinse and drain cannellini beans then set aside. Rub pork belly with smoked paprika, rosemary, salt and pepper. Heat the olive in a pan and fry the pork on a high heat until browned on both sides. Do not overcrowd the pan otherwise it will stew instead and not brown, if necessary fry 1 or 2 pieces at a time. Once the belly pork has browned remove from heat and set aside. Add more oil to the pan and sauté the onion, carrots and celery for 6 minutes until soft. Return the pork to the pan then add the cannellini beans, tomatoes, bay leaves and chicken stock. Bring to the boil, reduce heat to low, cover with a lid and simmer for 1½ hours or until the meat is tender. In the last few minutes of cooking add the chopped parsley. Check consistency, if too liquidy whack the heat up high and reduce. I served this with steamed kale. 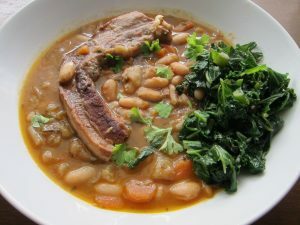 Belly Pork and Cannellini Bean Stew is nice recipe, I must try it. Hi Mark, thanks so much for your comment. I still often cook this. Like the idea using of smoked belly too.